Every Forest Therapy walk that I guide starts with an acknowledgement of the land and indigenous peoples that have walked here before us. As Canada Day approaches, the weight and importance of this topic is at the forefront of my mind. In timely synchronicity, this special piece of writing on the topic of land acknowledgement and how we can move forward as Canadians was recently written by one of my most influential yoga teachers, Emma Dines. Copied from the Queen Street Yoga blog, her original piece can be found here. 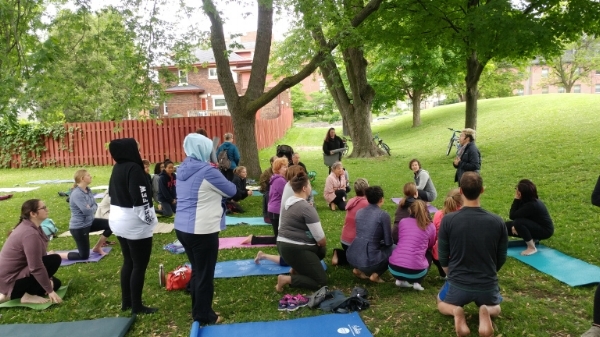 Emma Dines delivering a land acknowledgement to a thoughtful group before commencing their Yoga in the Park practice in downtown Kitchener. As I looked around at the people gathered for yoga in the park, I saw many of them nodding their heads. I saw more recognition and understanding in their eyes than I did several years ago when I began doing land acknowledgements. My voice picked up and I spoke about how this land that we live on is what sustains us, that we all love to come outside because we are reminded of how the earth feeds us, the air breathes us, the sun grows us, and the trees shade us. We stood under the trees for a moment together, listening to the wind in the leaves. The band struck up the first notes of O Canada. My hands grasped the lanyard. As the song began to swell, I hauled on that rope. The flag inched up the pole, then caught in the breeze, fluttered and began to wave. As I watched it gain the sky I did feel honoured. I was filled with a crazy sense of possibility, as if that flag could make anything happen. Emma Dines is the creative director of Queen Street Yoga in Kitchener, Ontario. She loves writing, visiting thrift stores and going for walks in the woods. She also loves cartwheeling, sewing and making her own kimchi.